Was Soviet Union ruler Joseph Stalin a psychopath, or just a successful dictator? One of the key assumptions of DSM-IV is that psychopathology has to cause distress or dysfunction. In other words it has to be self-defeating. But what about behavior that causes gross distress and dysfunction to others? If the individual benefits by his or her behavior but other people suffer, does that count as psy-chopathology? This quandary shows how difficult it can be at times to determine what does and does not constitute psy-chopathology. Additionally, it illustrates the difficulty in distinguishing between psychopathology and extreme immorality. Joseph Stalin (1879-1953) is a case in point. Stalin was appointed general secretary of the Communist party in 1922 and gained complete control over the Soviet Union when Vladimir Lenin died in 1924. He retained absolute power until his death in 1953. Within five years of Lenin’s death, he was responsible for the execution of several million people. Stalin brooked no opposition to his regime. Anyone suspected of opposing him or of even having the potential to oppose him might be deported to Siberia, tortured, and/or executed. He has also been accused of causing or at least greatly exacerbating famines that killed millions of people. 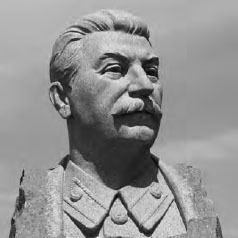 Historians now believe that Stalin was responsible for the death of—at minimum—20 million people. Would Stalin meet DSM-IV criteria for Antisocial Personality Disorder? It appears that Stalin met at least five DSM-IV criteria for Antisocial Personality Disorder. He repeatedly broke the law before he was in power; and after attaining power he simply created the law to suit his needs. He lied and conned others to maintain his position of absolute power. As a mass murderer he was clearly irritable and aggressive. He showed reckless disregard for the safety of others; he showed lack of remorse for the mistreatment of others. Stalin also demonstrated aggressive and illegal behavior in his youth, which may meet criteria for conduct disorder before the age of 15. However, he was a brilliant and immensely successful politician. Despite having murdered tens of millions of people, he was able to hold onto power until his death at age 74. Thus, his genocidal behavior may not have caused distress or dysfunction to himself, although it certainly did to others.